Our Arts & Crafts X-Base Dining Table is on a Mission to be the centerpiece of your family gatherings. Its clean lines feature subtle curvature that is sure to blend in with your decor seamlessly. The Amish woodworkers in this Shipshewana, Indiana, woodshop are dedicated to delivering only the best in Amish furniture for you and your family. 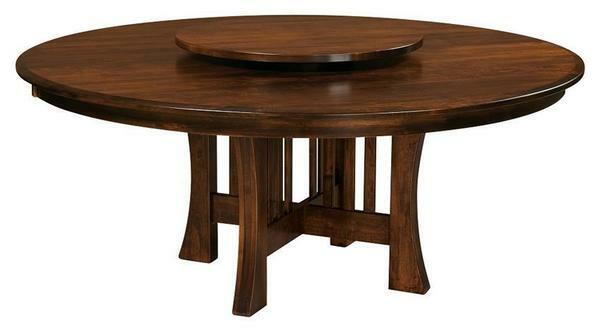 This dining table features 100% solid hardwood construction that is of heirloom quality. There is a 1" round top with bevel edge, as well as levelers and an X base. It is 30" high, but we offer the option to have your table made in a 36" or 42" high height as well. Along with the choice of your wood and stain, you will be able to choose from a variety of options in order to ensure that this dining table is best suited for your home. From table size and extensions to your choice of table top thickness, you and your family will love enjoying a custom dining table at all gatherings. The addition of a lazy susan will make for even greater enjoyment when everyone is gathered around the table. All will be relaxed and at ease thanks to the superb skills of our Amish woodworkers. Should you have any questions about this dining table or any of our American made furniture, we would love to hear from you. Please get in touch by calling 866-272-6773 to speak with a friendly Amish furniture specialist.